In commercial facilities such as schools and medical centers, it’s not always enough to have standard door locking mechanisms — as what they secure creates additional liability. So, smart facility supervisors rely on state-of-the-art electronic security hardware. This integrated hardware can range in complexity from wireless, real-time access control systems to magnetic door position switches and alarmed delayed egress to electric latch retraction exit devices. As use of access control systems that utilize wireless technology increases, electronic locks in areas such as medical centers become increasingly valuable and cutting-edge. To protect everything from medical information to devices such as 3-D printers, these systems provide online, remote access and real-time control with easily upgradeable modules to adapt with other technology. 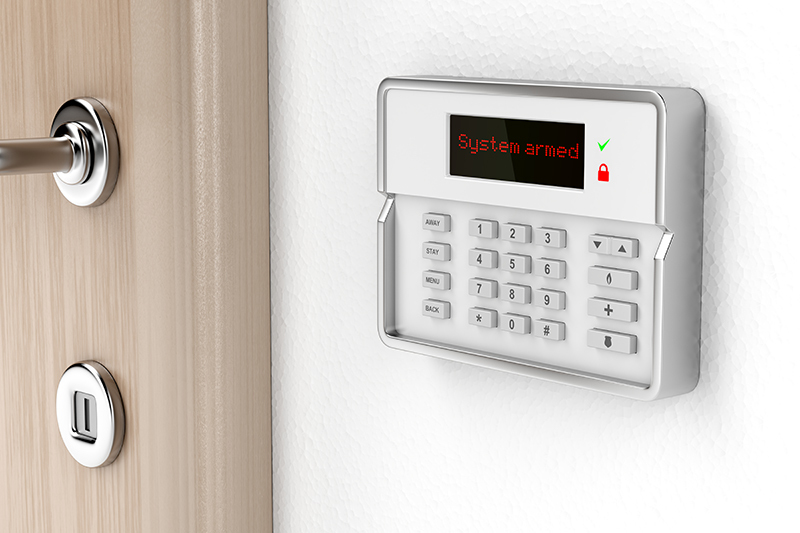 These systems incorporate electrified locks, credential readers, request-to-exit and door position switches — and even tamper guards — to keep valuables as secure as possible. These popular systems easily integrate into both exterior and interior doors. A less high-tech but popular electronic security entrance hardware is using the door position switch alone. This switch utilizes the circuit between a small magnet at the edge of the door and a magnetic reed switch adjacent to the doorframe. Opening the door breaks this circuit and sends a signal transmitting that the door has been opened. If desired, this signal may trigger an alarm. This system is used in exterior but mostly interior doors protecting valuable items. In terms of egress devices, one high-security option often used in computer or science labs with large, valuable materials is the delayed egress exit system. Someone exiting the secured room must wait fifteen seconds while and alarm sounds until they are permitted to exit. This calls attention to any unwanted visitors attempting to sneak valuable materials out of the labs but is harmless when any authorized personnel are exiting. A final example of electronic security hardware used for exit doors is the electronic latch retraction exit device. This system acts as a normal exit device until power is added, when the latch bolt then retracts and door can be opened without use of a push rail or lever. This is most often used for hands-free entrances with card reader or those that are remotely controlled. For more information about electronic security hardware from SAHR Building Supply, please contact us here or call us directly at 855.724.7934.